That discrepancy in the playing field is reminiscent of previous “wave” elections. In April 2010, there were 68 vulnerable Democratic House seats and 11 vulnerable Republican seats. Republicans gained 63 seats later than year. And in May 2006, there were 42 vulnerable Republican seats and 11 vulnerable Democratic seats. Six months later, Democrats gained 30 seats. Of course, just because a seat is vulnerable, it doesn’t mean a race is lost. But the larger number of vulnerable seats means Democrats need to win a smaller proportion of the total competitive districts to gain the 23 seats necessary for the majority. California’s 7th District (Ami Bera, D) from Likely Democratic to Solid Democratic. Florida’s 13th District (Charlie Crist, D) from Likely Democratic to Solid Democratic. Iowa’s 1st District (Rod Blum, R) from Tilts Republican to Toss-up. Maine’s 2nd District (Bruce Poliquin, R) from Likely Republican to Leans Republican. New Jersey’s 5th District (Josh Gottheimer, D) from Tilts Democratic to Leans Democratic. New Jersey’s 7th District (Leonard Lance, R) from Leans Republican to Tilts Republican. New Mexico’s 2nd District (Open; Steve Pearce, R, running for governor) from Likely Republican to Leans Republican. Pennsylvania’s 17th District (Keith Rothfus, R/Conor Lamb, D) from Tilts Republican to Toss-up. Virginia’s 7th District (Dave Brat, R) from Likely Republican to Leans Republican. Arkansas’ 2nd District (French Hill, R) from Solid Republican to Likely Republican. California’s 4th District (Tom McClintock, R) from Solid Republican to Likely Republican. Georgia’s 7th District (Rob Woodall, R) from Solid Republican to Likely Republican. Michigan’s 7th District (Tim Walberg, R) from Solid Republican to Likely Republican. New Jersey’s 3rd District (Tom MacArthur, R) from Solid Republican to Likely Republican. Ohio’s 1st District (Steve Chabot, R) from Solid Republican to Likely Republican. Ohio’s 14th District (David Joyce, R) from Solid Republican to Likely Republican. Texas’ 21st District (Open; Lamar Smith, R, not seeking re-election) from Solid Republican to Likely Republican. West Virginia’s 3rd District (Open; Evan Jenkins, R, ran for the Senate) from Solid Republican to Likely Republican. 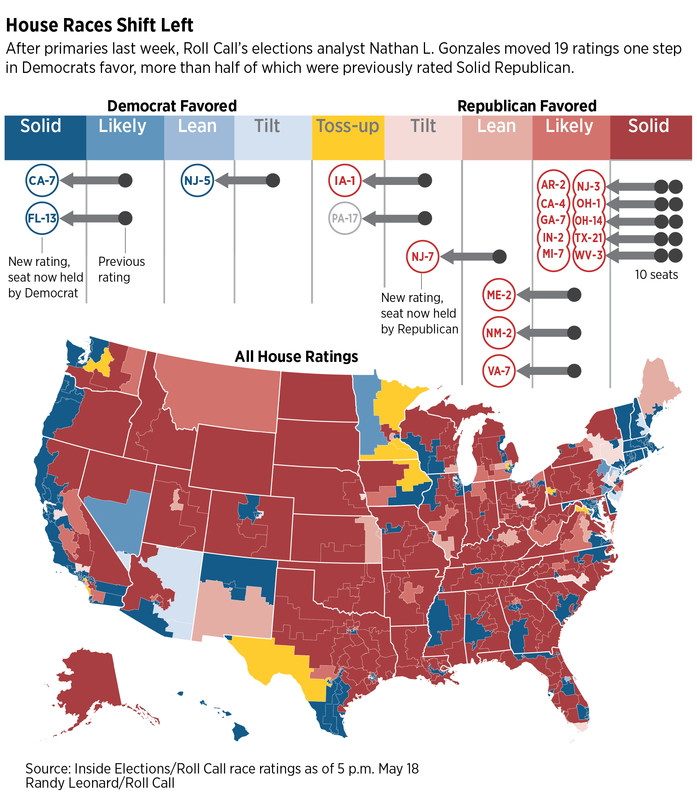 More analysis of each competitive race is available at RollCall.com and in the May 16 issue of Inside Elections.